Ribbit Me This: What Do 99-million Year Old Frogs in Amber Found in Myanmar Tell Us? A young frog trapped in amber 99 million years ago and now found in Myanmar has reinforced the hypothesis that frogs have been living in swampy environments throughout much of their evolution, according to a report in Nature’s Scientific Reports on Thursday. In fact, we had not known this. "For most early frogs, we don't know with much certainty what type of habitat they lived in," Dr. David Blackburn of the Florida Museum of Natural History tells Haaretz. "The few for which we do have that information seem to have lived in seasonal and open environments. Today, many species do live in seasonal, open environments such as marshes. However, many species also live in wet tropical forests, alongside streams, in high-elevation grasslands, and even more arid desert environments." 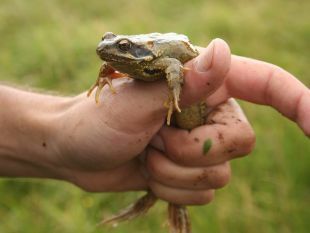 Frogs have been around for at least 200 million years and possibly more than a quarter-billion years. We had not been sure whether they were marsh-dwellers all along for a number of reasons, one being the sheer scarcity of frog fossils. "This is probably due in part to these being small animals that sometimes have lightly built and fragile skeletons that fall apart easily after death," Blackburn observes. So if one finds a frog fossil, chances are it hadn’t been a trembling delicate flowerlike animal but a biggish beastie that lived in an environment conducive to preservation and fossilization, i.e., not a swamp. The discovery of Electrorana limoae, the amber-interred frog that lived in the Cretaceous, sheds light on the interim period, as described in this new paper by Lida Xing of the China University of Geosciences, Blackburn, Edward Stanley of the Florida Museum and Ming Bai of the Chinese Academy of Sciences. “What’s most exciting about this animal is its context. These frogs were part of a tropical ecosystem that, in some ways, might not have been that different to what we find today - minus the dinosaurs,” Blackburn says. Even though amphibia may not have to have the brain part that would make them capable of affection, people think they’re adorable. Especially the poisonous ones. So we care about their evolution. Genetic “molecular clock” calculations indicate that frogs have been around for over a quarter-billion years, dating back to the Permian. That and other evidence shows that frogs developed on the supercontinent of Pangaea, which explains their worldwide distribution today. The forefathers of frogs survived the terrible Permian-Triassic mass extinction. Then they seem to have muddled along living low-profile lives for millions upon millions of years. The ancestral frogs would only be massively fruitful and multiply, and diversify, after the dinosaurs all but disappeared 65 million years ago. A lot of species that had been underfoot during the dinosaur age, including mammals, did spectacularly well once the monsters were gone. Among them were three “modern” frog lineages, the hyloidea, microhylidae and the natatanura, which appeared just after the dinosaurs’ virtual disappearance (don’t forget dinosaurs didn’t actually go extinct; one branch turned into birds). 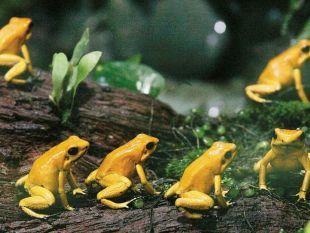 The question is in what environment frogs lived in throughout these hundreds of millions of years. 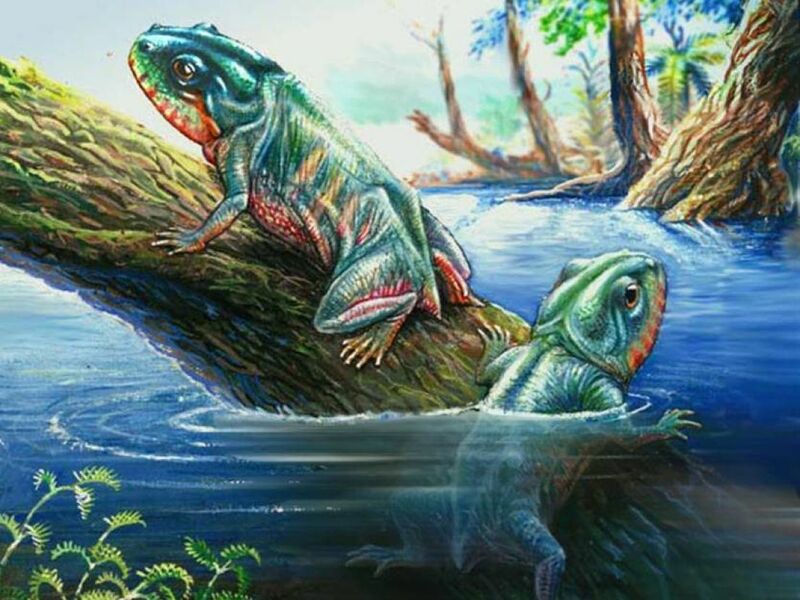 The earliest froggiform amphibian we have fossil evidence of is Triadobatrachus massinoti, a rather large creature perhaps 10 centimeters long, which is considered to be primitive in having a very long back. Triadobatrachus lived in the Triassic, about 250 million years ago, in what is today Madagascar. Nobody is saying Triadobatrachus is the father of all frogs, but it may have been, and it seems to have lived in both freshwater and on land. In other words, it apparently lived like today’s amphibia, in freshwater swamps. We don’t know if Triadobatrachus could jump, but researchers suspect not. The earliest known proper frog that could hop was Prosalirus, whose remains were found in Arizona. Prosalirus lived in the Early Jurassic around 190 million years ago at which time Arizona was characterized by wetlands. Now 99-million year old Electrorana limoae has been found trapped in amber in Myanmar, together with a beetle that it probably wanted to eat and some ants with remarkably long legs. The fossil, less than an inch long, contains the frog’s skull, forelimbs, some vertebrae, a partial hind limb and the unidentified beetle. Other globs of amber contain two forefeet and an imprint of a frog. Given that frogs don’t fossilize often or well their because gracility, inevitably skewing the fossil record toward “more robust species from arid, seasonal environments,” there was precious little evidence that frogs preferred wetlands all along. Being fossilized tree sap, amber is fantastic for showing not only its trapped victims, but how they lived. The Myanmar amber features fossil evidence of mosses, bamboo-like plants, aquatic spiders and velvet worms - the remains of ancient forest, the team writes. 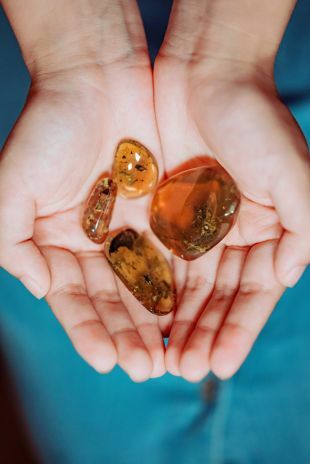 So this bit of amber with the tragically trapped frog (“Unlucky for the frog, but lucky for science,” they observe) and other bits of amber from the same origin, show that Cretaceous frogs also inhabited wet, tropical forests. Other frogs were found in amber in the Dominican Republic and Mexico, but they date back to “only” 40 million and 25 million years, respectively. One mystery raised by the long-dead Electrorana is whether it has any living relatives, but if it does going by morphology - they seem to include the deadly fire-bellied toads and even deadlier midwife toads of Eurasia, which live in temperate to cold, not tropical, ecosystems. But 99 million years of evolution can do that to a species.